I tried to resist the lure of The Hunger Games, but alas. My curiosity got the better of me. And that’s all right, because I’ve found the book is a real page-turner. I resent having to put it down, and it sometimes gets in the way of more important endeavors, like fixing dinner and folding clothes. I thought I was the last person in America to read the book, which, in case you’re more square than I am and haven’t read it yet, details a dystopian American future where the 1 percent forces the 99 percent to send their children to play a kind of televised Survivor death match, all for the entertainment of the wealthy. So a couple weeks back I was discussing The Hunger Games with a friend, who said she could not stand the book. Her gripe: It depicts children trying to kill each other. That’s not a new literary theme, I reminded her, bringing up an obvious comparison: William Golding’s Lord of the Flies. Oh, sure, she said. Of course. But the big difference there was that adults weren’t orchestrating the bloodbath; Lord of the Flies was all about base human instincts, but no adults were involved. It seemed, somehow, more humane, she said. What troubled her about The Hunger Games, on the other hand, was the machinations of adults to use children for their own gain – for their own pleasure. That, she said, seemed inconceivable. Well, not so much. And here’s why. Cable’s multitude of banal offerings includes such reality fare as the Real Housewives franchise, the Kardashian chronicles, Ice Road Truckers and the any number of other stellar viewing options, ranging from Jersey Shore to the various talent shows like American Idol and The Voice. Americans, it seems, like to watch real people squirm and cry and possibly throw punches. So there’s that. Couple that with how we treat children in this country, and The Hunger Games makes perfect sense. But get down to brass tacks, and as a nation we really don’t take care of our children. Otherwise, we’d spend more on public education and less on wars. We’d not denigrate parents who choose to step off the career track to stay home with the kids. And we’d not allow states like Missouri to price working low-income parents out of reliable daycare. Reliable daycare helps all working parents. But for low-income parents, it’s one major hurdle to overcoming poverty. If you don’t have to worry about who’s taking care of your kids, you can find a job and become a productive worker, or finish your GED and go to college. 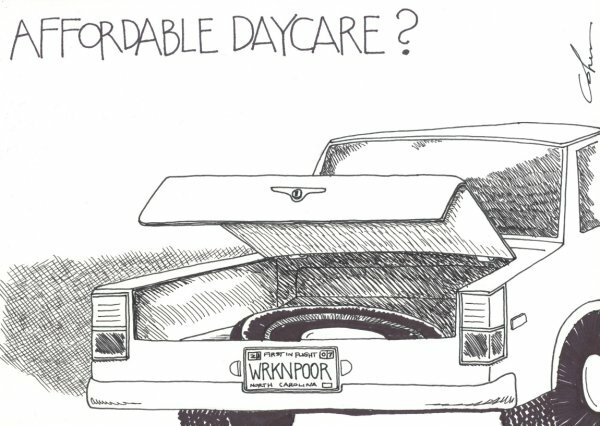 But last week, a Missouri Senate committee proposed a $16-million cut in childcare subsidies for poor parents. That’s along with proposed $13.6 million cuts in the state’s foster care budget and the loss of child protection jobs. If the Missouri daycare-subsidy cuts go through, almost 4,000 children will lose their daycare monies. Families who make $23,290 – the current funding threshold – will be out of luck. They’ll earn too much money to qualify for daycare subsidies. Only families who make at or below $19,663 – 103 percent of the federal poverty level – will qualify. The federal government supports childcare subsidies, but states set their own income thresholds. If these cuts are approved, Missouri becomes the state with the lowest income threshold. Attacking the welfare family is a common theme during election season, but guess what, folks? We’re now going after poor people who are working. “It means that families who work and who make more than the federal poverty level may not be able to keep their jobs, and they may have to resort to going back on welfare,” Carol Scott, CEO of Child Care Aware of Missouri, told the St. Louis Post-Dispatch last week. So, yeah. I don’t think a book about wealthy adults watching poor kids compete to see who can outwit and outlive each other is so far-fetched, judging from the way things are going right now. The Hunger Games speaks of a dystopian future that’s within our reach, not unlike Margaret Atwood’s 1985 novel The Handmaid’s Tale. You are not the last. I am. Just reading it now. I’m almost finished with it. Can’t wait for my classes to be finished so I can read what I want!